Semi Ryu is a media artist who specializes in experimental 3D animations and virtual puppetry, based on Korean shamanism and oral tradition of storytelling. She is a tenured associate professor in the Department of Kinetic Imaging, VCU Arts, with joint appointment as an associate professor in the Department of Internal Medicine, VCU School of Medicine . She was a Visiting Scholar at Center for the Arts in Society, Carnegie Mellon University during Spring 2016, and is a visiting professor at UOC, Information and Knowledge Society, Barcelona, during Spring 2019. Ryu earned a BFA from Korean National University of Arts, an MFA from Carnegie Mellon University, and is currently pursuing a Doctoral program in Information and Knowledge Society, UOC, Barcelona, in the area of Digital Culture/Anthropology. Ryu’s art works have been presented in screenings, exhibitions, performances and publications in more than 20 countries. Her animations have won numerous awards, including “Best Young Animated Film Award” at International Festival of Animated Film, Stuttgart, Germany, and have been official selections screened at International venues, including: Annecy Animation Festival, France; Transmediale, Berlin; Holland Animation Festival, Utrecht, Netherlands; VideoBrasil, Sao Paulo, Brazil; Anima Mundi, Sao Paulo; ISEA, Nagoya, Japan; KROK, Moscow, Russia; and SIGGRAPH, Los Angeles. Her virtual puppetry have been presented in exhibitions and performances, including: Chelsea Art Museum, New York; Red Gate Gallery, Beijing; Antonin Artaud, London; Galelia Olido, Sao Paulo; Museum of Modern Art, Toluca city, Mexico; De Balie, Amsterdam; and ETH, Zurich. Her academic papers have been extensively published in international journals and conferences. One of her papers “Ritualizing Interactive Media” was commended for exceptional quality in Leonardo review (MIT press, 2005). She co-authored a book, The Point of Being, with former McLuhan program director Derrick de Kerkhove, Cristina Miranda and others (Cambridge Scholars, UK, 2014). She served as senior advisor for the “Avatars for Virtual Heritage” project, funded by National Endowment for the Humanities (2011). 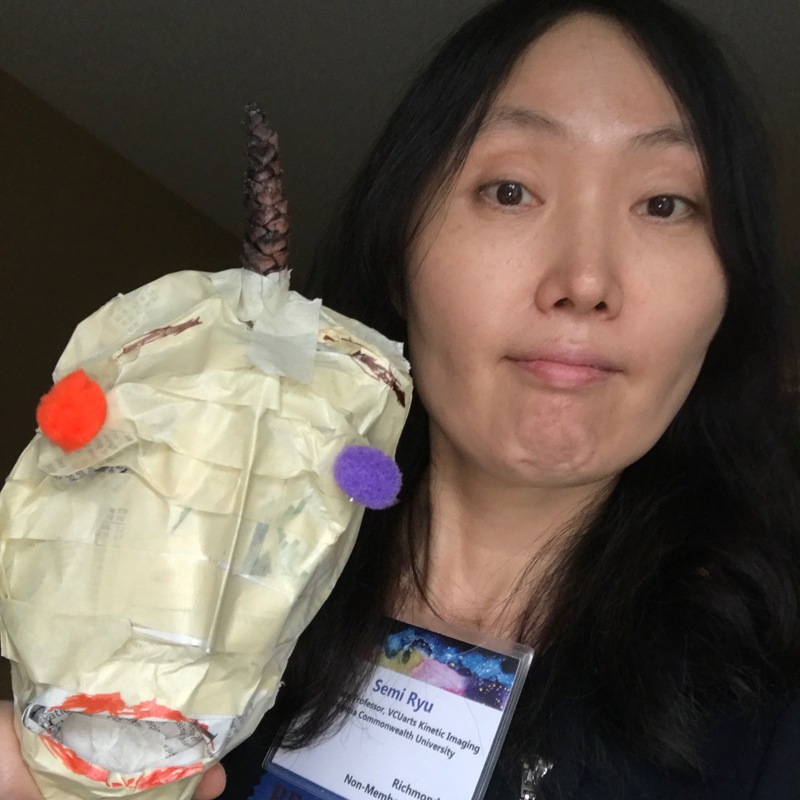 In 2014, her transdiciplinary project “VoicingElder: Improving Quality of Life for Older Adults with Avatar Life-Review” won VCU Presidential Research Quest Fund and has been presented in international venues of art, gerontology, drama therapy, and HCI. Her current project is VoicingHan: Avatar Life-Review for Palliative Care, funded by Massey Cancer Center. Semi is the recipent of VCU arts faculty award of distinguished acheivement in research, and VCU arts dean’s faculty research grant award in 2017.